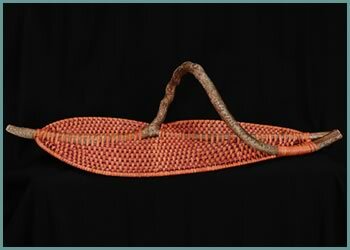 H 14" W 18" D 10"
This basket was created with a woven wall inside so she has two pockets. Framed in bittersweet and woven in aubergine-colored reeds. 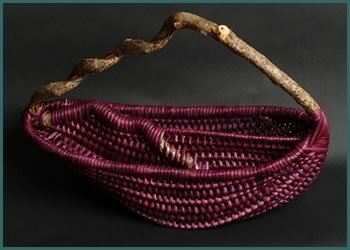 H 12" W 20" D 14"
This basket was made from one single forked branch of bittersweet vine. Woven in rust-colored reeds and with wine-colored spokes. 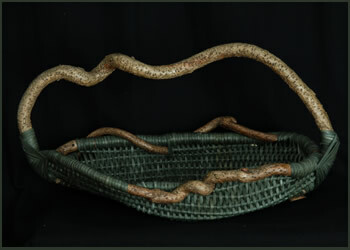 H 13" W 27" D 14"
Contemporary woven sculpture, this basket is framed out of bittersweet and woven in dark green reed.